Ask any bartender and they will tell you that Martini drinkers are a particular group. Each believes that their particular way of making a Martini is the only way to make it perfectly. Some bartenders say it all begins with the preparation. Is the perfect martini served straight up or on the rocks? Others bartenders believe that a martini served straight up, without ice, should only be stirred in mixed glass with ice. Still other bartenders prefer the James Bond method of shaken the ingredients in a metal mixing cup filled with ice before pouring into a stemmed cocktail glass. Another group of bartenders argues it’s not preparation but the amount of dry vermouth used. Dry, extra dry, or no vermouth is constantly discussed among bartenders and their customers. We teach at the American Bartenders School that a great martini recipe must have a dash dry vermouth to make it a true martini. Without dry vermouth it’s only straight gin or vodka. Something no lover of martinis would ever tolerate. 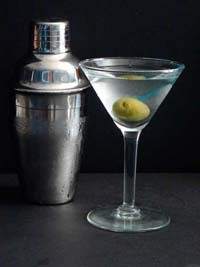 Originally, when the Martini became popular in the 1920’s and 30’s they were always made with gin. Today vodka is the preferred base liquor, but gin is still popular. Martinis started as a before dinner cocktail drink served with no garnish. Eventually, an enterprising bartender decided to add an olive. The olive served as an appetizer and was especially tasty because it’s soaked in a mixture of liquor. Today a lemon twist is popular which adds a lemon peel sent to this nectar of the gods. Here at the American Bartenders School New York and New Jersey will teach both ways. In the end, the perfect martini is in the eyes of the drinker.